ited to audio frequencies no higher than about           square wave harmonics. There are many RF instruments sold today              with only 5% power. can only output a few of the original frequencies. 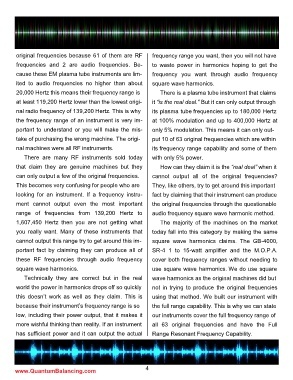 cannot output all of the original frequencies? range of frequencies from 139,200 Hertz to               audio frequency square wave harmonic method. portant fact by claiming they can produce all of         SR-4 1 to 15-watt amplifier and the M.O.P.A. has sufficient power and it can output the actual        Range Resonant Frequency Capability.